Council Meeting 26 March 2019. Item 1 on the council agenda of 26 March 2019. 4. Call on Councillors who following the adoption of the DCP have made potentially defamatory statements and imputations about other Councillors or who through those comments may have brought the Council into disrepute to withdraw those comments and apologise. 2. A further report be received by Council following public exhibition of the draft Amendments referred to in point 1 seeking Council’s decisions whether to adopt these draft amendments to Marrickville Developer Contributions Plan 2014 (Victoria Road Precinct 47 sub - plan) and Marrickville Development Control Plan 2011 (Victoria Road Precinct 47). Precinct 47 (P47) is located along Victoria Road at Marrickville and bounded by Sydenham Road to the south and Addison and Edinburgh Roads to the north. The Precinct was rezoned by the NSW Government in December 2017, to permit new multi-unit residential, mixed use and business development uses, significantly increasing development potential within the Precinct. A DCP to manage development within the Precinct was adopted by Council in July 2018. To deal with the identified most critical local infrastructure needs, namely stormwater mitigation and transport needs, consultants were commissioned to inform the development of a local contributions plan for the Precinct. A contributions plan has subsequently been prepared, as an addendum to the existing Marrickville Section 94/94A Contributions Plan 2014, which includes transport improvements (located on public land) valued at about $0.6m and stormwater improvements valued at about $15m. Although monies will be collected first for these critical infrastructure items, the precinct will also continue to meet existing contribution requirements for recreation and community facilities within the Marrickville Contributions Plan 2014. Given that the critical infrastructure requirements for the Precinct can be met within the existing “cap” it is not proposed to recommend a review of the cap in this instance. As not all of the required traffic and transport improvements for the Precinct are to be addressed in the contributions plan, amendments have been necessary to the adopted DCP to ensure the orderly delivery of this additional transport infrastructure, and for the delivery of that part of the required water infrastructure works that occurs on private land. Amalgamation plans are recommended to be included within the DCP to help ensure the delivery of this additional infrastructure. Other recommended changes to the adopted DCP for the Precinct relate to addressing some of the matters raised at the time of the adoption of the DCP which arose from the public exhibition of the DCP. Supporting information on the consideration of the draft plans forms Attachment 1. It is recommended that the draft Contributions Plan and amended draft Development Control Plan be placed on exhibition for a minimum of 28 days in accordance with the Act. The Victoria Road Planning Proposal was approved by the gazettal of an amendment to the Marrickville Local Environmental Plan 2011 (MLEP 2011) on 1 December 2017. Council is now considering associated amendments to Part 9.47 Victoria Road Precinct of Marrickville Development Control Plan 2011 (draft Victoria Road DCP), which was initially drafted by the proponent of the Victoria Road Planning Proposal, (Ethos Urban/Danias Holdings Pty Ltd), in order to support the amended MLEP 2011. The draft Victoria Road DCP was publicly exhibited from 8 May 2018 to 5 June 2018 and 49 submissions were received. A report providing a review of the feedback from the public exhibition and recommended actions was tabled at the Council meeting on 24 July 2018. The report identified that during exhibition of the DCP several issues have required amendments to be recommended to the DCP in order that it can be finalised. Matters requiring amendment relate to road improvement works, transport connections, protection of heritage items, building design impacts and controls, drainage and flood risks and the like. A key matter highlighted in finalising the DCP has been the need to establish a clear and robust mechanism to secure the provision of infrastructure upgrades needed to support the development of the precinct, in particular drainage, traffic and transport improvements and open space requirements, before the DCP is finalised. This is because when the DCP has been approved, development applications can then be determined for the area, and if a suitable mechanism is not in place to deliver the infrastructure upgrades and any associated land dedications Council could be liable for part of the cost associated with the provision of these unbudgeted works, which preliminary work indicates could cost of as much as $50 million. The usual mechanism to ensure the provision of the upgrades through development contributions is through an amendment to the associated Section 7.11 (formerly Section 94) Contributions Plan. Work is currently under way in this regard and it is anticipated that it will take approximately six months to finalise that plan. Having said that, if the work on the plan identifies a shortfall of funding from development contributions to pay for the infrastructure necessary to support the upzoning in the corridor because of the current $20,000 cap per dwelling that applies to development contributions, Council may need to approach IPART for an increase in that cap. That would add more time to the process. Legal advice was obtained from Mr Hemmings SC to assist Council in understanding how the financial issues and risks identified above operate in a legal context. Such advice has been provided to Councillors previously under separate cover. At its meeting on 24 July 2018, Council resolved that the consideration of the DCP be deferred pending a meeting with interested Councillors, Department of Planning, the Proponent and Council Officers. That meeting took place on 13 August 2018 when interested Councillors were able to ask the attendees questions. Councillors have been separately advised of the content of what occurred at the meeting. · The applicant for the Rich Street precinct has indicated it could offer a voluntary planning agreement (VPA). With respect to the Rich Street DA, it is noted that the advice from Mr Hemmings addresses whether that DA (or any substantive DA within the corridor) can be approved before the DCP is made. Based upon the matters discussed in the report and the legal advice received, it is recommended that Council officers continue to work to finalise the Contributions Plan amendment and the DCP and that a report be made to a future meeting of Council on progress on these matters when the infrastructure needs for the corridor and their associated cost have been more clearly worked out. This is expected to take 3-4 months. The Victoria Road Planning Proposal was approved by the gazettal of an amendment to the Marrickville Local Environmental 2011 Plan (MLEP 2011) on 1 December 2017 (refer to Attachment 3 for the gazettal determination letter). The Victoria Road Planning Proposal re-zoned areas of IN1 General Industrial land to R3- Medium Density, R4 – High Density, B4 – Mixed Use and B5 – Business Development zones. These zones enable a range of built forms including residential flat buildings, commercial retail/office premises and mixed residential/commercial uses, enabling a potential increase of 1,100 dwellings in the precinct. 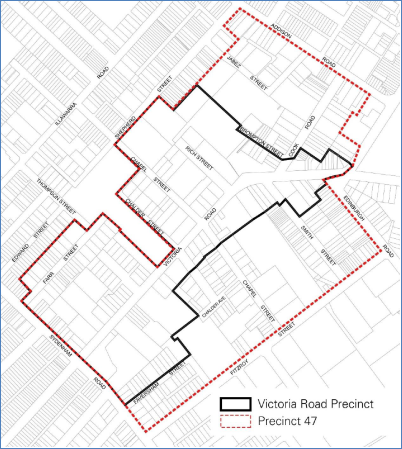 Image 1: Map indicating the area encompassed by the Victoria Road Precinct Planning Proposal (outlined in black) that forms part of Precinct 47 (identified in red dash) as defined under Marrickville Development Control Plan 2011. (i) the protection of public open spaces (including from overshadowing). Clause 6.18 was also inserted which requires satisfactory arrangements to be made with the State Government regarding public infrastructure, most specifically some widening at the intersection of Victoria and Sydenham Roads. 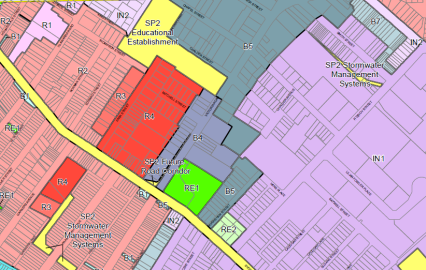 The current zoning map of the MLEP 2011 for the precinct is below. 8.10pm - The Mayor, Clr Byrne adjourned the meeting as there was no quorum. 8.15pm – The Mayor adjourned the meeting to 6.30pm on 9 April 2019 as there was no quorum. Councillors Hesse and Lockie declared a significant, pecuniary interest in Item 1 as point 4 of the motion is the subject of an unresolved legal matter to which they are a party to and they will leave the chamber during discussion and voting. Councillor Steer declared a significant, non-pecuniary interest Item 1 as she has been instructed to give pro-bono legal advice to Clr Hesse.